My side business was very successful. By limiting myself to just 2 or 3 different computers, I saved a lot of time because I could always stock the parts needed for those 2 or 3 models, plus I knew how to tear those units down and put them back together very quickly because I worked on them all of the time. And when one unit was not repairable, I could strip it for spare parts to use on other machines. Also selling the units was easy because they were essentially all the same. So my business was very streamlined and efficient. On a good month I could sell several hundred laptops. Of course, I was looking for ways to reduce the fees I had to pay to places like ebay. If I could sell computers directly from my website, I could sell them cheaper to the end customer and actually end up making more profit. I just needed a way to get people on the website. So I decided to create some how-to videos related to the machines I sold and put them on youtube. The irony is, the videos became very popular but had almost no effect on my computer sales. So I didn’t spend any more time making them. Eventually, around 2011, business started to slow down. My profit margins were shrinking. The prices of used MacBooks were falling so fast that I could no longer buy them and sell them at a profit. So I eventually decided to close down the business and sold out all of my remaining inventory. Once my time was freed up from having to work on laptops all day, I noticed that my youtube channel was still growing in popularity. So I decided to monetize it and start making some new videos. After a year or so, I was making enough money to invest in some better video equipment and convert an unused bedroom in my house to a studio. Over time I started to run out of ideas for videos related to iBooks and MacBooks, so I started thinking of more mainstream concepts. This actually caused my channel to move from about 20,000 subscribers to well over 100,000 in just a few months. I was blown away at how many people liked my show. Awesome Airguns – I briefly had an interest in airguns and since there wasn’t much of any good content about them online, I decided to change that. The channel had several problems, though. One thing is I couldn’t think of much content. The other was the fact that once a video became popular, many people would flag it as being “dangerous” and so it would get age-restricted and thus de-monetized. So I decided not to make any more videos for that channel. The Bullion Channel – I like collecting little silver coins and stuff. I noticed there wasn’t much of any good content about it online, so I decided to change that. But the channel was never popular so I didn’t create anymore. Cranial Pasta – I wanted to do a channel on science, specifically debunking things like bad science used in hollywood movies, or stupid conspiracy stuff like chemtrails. But I wanted to add some humor into it. The videos were extremely time consuming to make, and the channel never even made a single cent. So I abandoned it. So I stayed with my core channel “The iBookGuy” and kept growing it. But eventually, I realized I needed to change the name since there would only be occasional episodes about Apple products, specifically iBooks. I wanted something that sounded very similar, but could be much broader. So I settled on “The 8Bit Guy.” Most people were happy with the name change, but I think some of my original audience were not. But, I can’t please everyone. 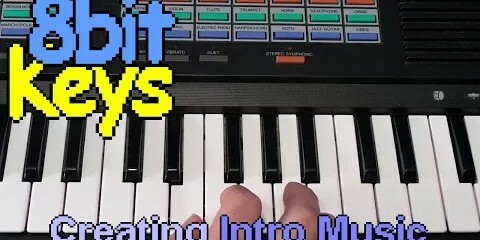 I also started up another channel called 8Bit Keys, which I’m very excited about. I’m actually splitting my time 4:1 between The 8Bit Guy and 8Bit Keys. So, I attempt to make at least one 8-Bit Keys episode every month, and at least 4 8-Bit Guy episodes each month. Speaking of time. Lots of people ask me why I don’t make more episodes. Even now that YouTube is my full time job, a typical episode requires about 10 to 30 hours to produce. I think 15 hours is about average. However, my time is also divided between handing the huge volume of email I get, coding for my game, and shipping merchandise, among other things. As such, I feel like I’m doing well if I can produce 5 episodes per month.